We have been customers of theirs since 1989 when they were Cabletel and just get fobbed off when we try to get somewhere near what we are paying for. I did post a few weeks ago asking for advice on what to do and how to phrase a complaint but after being told I 'didn't know what I was talking about' by one of the Virgin trolls I gave up. The daft thing was that my post was obviously stating that I didn't know what I was talking about and needed help to try to explain to a telephone twerp (I do have skills in assessing telephone support) what was wrong. Any advice welcome (even from Virgin fan-boys) welcome. P.S. These problems usually happen after heavy rain. We have been told that can't possibly be the cause but it still happens. DOCSIS is not meant to suffer the same weather issues as the DSL services, but its always possible. Still just as bad BUT at least the voip still works and we can download very slowly. It's almost always after rain and then things get back to normal after a few days. Living in Cardiff the weather tends to be a little wet! Await the horde of Virgin lovers who claim it can't possibly be a problem because only something like 1% of customers have the problem. Several things can affect it. Look for your local cab and make sure the door is shut. It can also be that when it rains more people stay inside and download video which will slow your cable segment up as the bandwidth is shared over all the people on that segment. Best to post your power levels, both upstream and downstream, Particularly post both dry and rain conditions, as this will prove water ingress. These will help in diagnosis and you will have some evidence of faults should you need it to complain. Also have a look at the brown box and make sure it's secure. My neighbour's wiring is exposed and a mess. It was like that with the cover on before she got virgin to come and fix it. However sounds like congestion to me for which the above advice won't change didly. I always thought the more people who leave VM for FTTC etc means the network would be less hammered, this would be true if VM didn't just sell to more and more people than do leave. As usual after every glitch it has gone back to normal. In fact it's better than it has been for ages - was getting 20 download before disaster now getting 76 - the upload is usually 4 to 5 whatever the download is. Area 21 appears to be vast, covering a great chunk of south London from Wandsworth in the west to Greenwich in the east and I have no idea how far south, and unsurprisingly there is a lot of variability within that area. I have recently written a good old fashioned, snail-mail, formal complaint to VM because the service here was down completely for me 1-3 December, allegedly because engineers were working �installing additional equipment to improve the service�. The latter is long, long overdue, and is to be welcomed, but it should be perfectly possible for them to do such work, test it without disrupting the current service, and then switch it into service in the middle of the night without creating mayhem. And when they finally did get the system back up who was the last person to be told ? I don't think VM have the first idea about customer service. 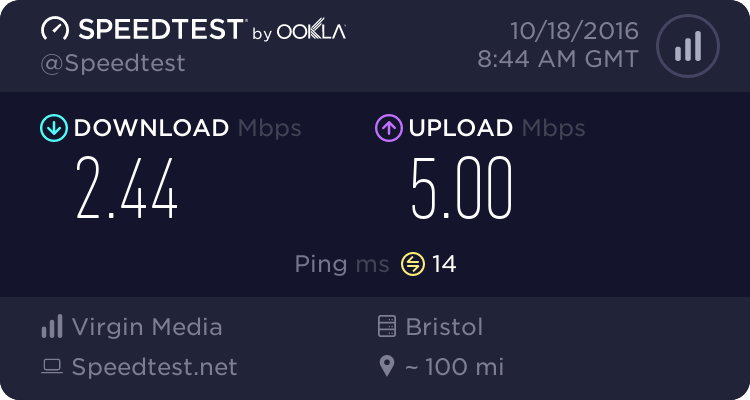 Now I am suffering the same poor service as many others are reporting, speeds hitting rock bottom in early evening, and being told that it is all down to congestion. Tell me something new. - is VM making the necessary investment in the existing network on a predict and provide basis ? No, not nearly enough it would appear. Instead it is investing a massive £3bn as part of project Ligtning to increase its customer base from 7 to 11 million i.e. buying new customers at a cost of £750 each, whilst it is spending only an estimated £0.5bn on upgrading the services for its existing 11m customers i.e. less than £50 a head. What can one do about it ? Bestie's suggestion that everyone (who is unhappy) leaves seems a bit extreme, although it might temporarily improve the situation for those of us that remain . It does not have to be long: you could simply state what poor service you are having, say that you are convinced that it is due to under investment in the existing infrastructure, which it is, and that you would like to see the existing investment rate tripled until such time as these problems are eradicated. Why write rather than complain over the phone (which is what they want you to do)? If you complain over the phone you simply get someone trying to fob you off with whatever they think will work, and then you just become a statistic. You write a letter and VM will take you a whole lot more seriously. and make the point that gaining 4,000 new customers but losing 1,000 existing customers will not do their cash flow (a key financial) any good what so ever. What is needed is for LOTS of people to write in so that the top brass becomes acutely aware just how many VM customers are really unhappy. They are almost certainly sheltered from that information. That includes everyone reading this post, then re-post it somewhere else and see how many more people you can get to write in. And for those of you active on Twitter, then tweet away at #virginmedia. Their PR people will be tracking it. I don't use twitter, I am area 25.